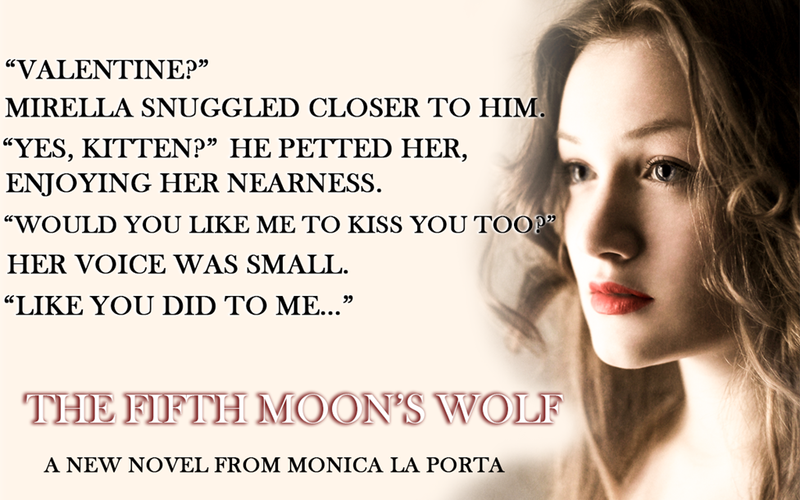 The Fifth Moon’s Wolf will be out April 19th, but here is the first chapter and a teaser to whet your appetite. His wolf pacing in his head, Valentine left the bed with an exasperated sigh and walked to the liquor cabinet by the arched window. Outside, the Fifth Moon shone pale blue against the purple night sky. Sidera Prima, the orbital station, cast a long shadow over the mountain ridge of the Caucasum, reminding everyone on Lupine of their terrestrial origins. “Are you pleased with me, Sir?” Ronda purred from the tangle of linens. The dark four-poster canopy took most of the wall opposite the window, dwarfing the redhead at its center. The burgundy drapery matched the long curtains framing the arch. The fabric was heavy damask silk salvaged from his private quarters on Sidera Prima. “You should talk less.” Lifting the heavy barrel with the H and M black letters etched on the wooden staves, Valentine poured a good two fingers of Laurum into a frosted glass goblet. The viscous drink sloshed inside the walls of the chalice, coating the surface with a deep, powdery red. Aged seventy-five revolutions, the Laurum was a wedding gift from House Martelli. After the Brotherhood of the Wolf, his own house, the vampires had been the first sending congratulations for Valentine’s impending nuptials. “Would you require my service after the ceremony?” Ronda moved sinuously on the bed, prowling on all fours like a hungry cat. “You know I won’t.” With a flick of his wrist, Valentine dismissed the courtesan, who, still naked, jumped off the high bed and scampered toward the back door that led into the servants’ passages. Hungry, he rang the bell to call his majordomo. Aldo’s steps echoed throughout the main hallway and stopped before Valentine’s bedroom a moment later. “What can I do for you, Master Lobo?” Aldo asked from the door. Lanky and lean, the majordomo was an example of how humanity had adapted to Lupine’s low gravity, whereas Valentine’s massive build was the epitome of a Terran. Although he had not been born and raised on ye olde Earth, Valentine shared all the traits of his werewolf ancestors: tall, muscular, with an unruly mane, and a propensity to rage. “I want to eat something before I leave for the ceremony.” As he walked to the breakfast table by the fireplace, Valentine grabbed the black kimono he had thrown to the floor. He put on the garment but didn’t tie it around his waist, letting the silky fabric flap around his back. “Refreshments will be ready in ten minutes.” Aldo bowed but didn’t leave. “If I may say something—” His eyes facing the floor, Aldo bowed lower. “Say it already.” Valentine plaited his mane in a thick braid. “Your spouse is young and innocent.” Aldo’s voice trailed as he stepped backward, retreating into the safety of the hallway. One of the mechanical dusters worked its way through the leather-bound tomes resting on the fireplace shelf. Their wrought-iron spindly legs and the black, round bodies always reminded him of the spiders that had once populated the space station. Their constant whirring and humming could be heard throughout Lobo Mansion and had become the sound of home to Valentine. He could spend hours watching their inner clockwork gears rotate, intersecting in a constant loop that created energy. If only Aldo knew how short would be his bride’s life… but that was Valentine’s personal burden to bear. Everyone on Lupine knew of what being a Fifth Moon’s Wife entailed. It was an unparalleled privilege for the family who raised the bride, and her sacrifice for the greater good of the Brotherhood was widely recognized. Statues would be erected in her honor. Valentine’s mother had her effigies displayed in the Goddess’ Temple, and every day women lit votive candles under the bronze sculpture. Only a few people knew that his wife wouldn’t survive the year. “She’s only twenty-five years old—” Aldo paused as if to gather his thoughts. “And she must be scared. You might remember that… when you are alone with her later tonight—” As soon as Aldo finished his halting speech, he left. Valentine pushed away the chair with more strength than it was necessary, sending the furniture against the opposite wall. He was annoyed by his majordomo’s words because, without knowing the whole extent of it, Aldo had just pushed one of Valentine’s buttons. Soon after the majordomo left, one of the house servants deposited a light meal onto the breakfast table. The girl kept her eyes low the whole time and retraced her steps out of the bedroom, being careful never to show her back to Valentine. The girl nodded and hurried outside, her wooden clogs soon echoing in the hallway. His request was carried out by a second servant. “Let him in.” Valentine placed the ornate knife on the ceramic plate. He knew his medicus would visit him before the ceremony, but his most recent appointment was only seven days ago and his health hadn’t changed in the short time passed. Yet, his wedding required a strict protocol to be followed, and even Valentine was to obey the ancient canon of the Brotherhood. Holding the big leather bag typical of his trade, Balenus entered the bedroom followed by two of his ancillae. The girls carried between them a large bronze vessel that was pearled with dew. Valentine noticed how the chosen nurses seemed to look younger with every visit of the middle-aged medicus. Balenus had a receding hairline and anachronistic paunch. On a planet where gaining weight was difficult, appearing not-athletic was a feat, but his status as Valentine’s medicus clearly gave him social clout. “Are we ready for the big night?” Balenus asked, voice loud and jovial as always. “It’s a night like any other.” Valentine didn’t stand but waited for the trio to walk to him. “Your life is going to change forever, Master Lobo.” The medicus chuckled, then motioned for the ancillae to come closer to Valentine. “Wash him,” he ordered the girls. Wearing white tunics, the ancillae knelt before Valentine, their heads low, their hands raised high, waiting for him to give them permission to touch him. “Go ahead.” He relaxed his back against the chair, opening his legs wide to give the girls easy access to his body. Hesitant hands poured the perfumed water from the vessel into a decorated basin, then the same hands cupped some of the water and dripped it between Valentine’s legs. He suffered through the ceremonial ablution in silence, wishing for the feather light touches to end. But the sooner he gave the medicus his fill of Vital Essence, the sooner he could go through the farce of his wedding night. When the hands weren’t able to coax the wanted reaction from his body, soft lips took turns on Valentine. Finally, he shuddered his release into a crystal ampule the medicus had promptly produced from his leather bag. “Excellent.” Balenus raised the flask high, studying its milky content against the amber light from the suspended brazier. “Flawless. As I expected from such a splendid specimen like yourself.” He stored Valentine’s Vital Essence inside a velvet pouch, then nested the pouch on a damask pillow with the Lobo’s insignia—a stylized wolf howling at the moon. “Dress him,” he said to the girls. Standing, Valentine opened his arms to facilitate the ancillae’s job. The kimono was removed and a high collared, burgundy shirt took its place, followed by black, wide-legged pants with the ceremonial slit on the front. The girls then helped him into a tight-fitting, gilded vest that completed his wedding uniform. “His hair.” The medicus pointed at Valentine’s mane. The girls waited for Valentine to sit, then worked dark-violet flower oil through his hair, setting his plait free, only to braid it again, starting from the front and adding thick strands toward the back of his head, creating a big ridged braid. “Shave him.” Balenus opened his bag and presented the ancillae with a golden razor, shave brush, bowl, and scented soap. The kit would then be cleaned and stored in the Goddess’ Temple alongside the crystal ampule. Valentine’s clothes would be stored and preserved as well as a memento of the night. He didn’t like all the pomp and ceremony surrounding what would be a procreation ritual, but he could understand the need for it. Far away from Earth, both in years and astral distance, his people clung to the old ways in a desperate attempt not to lose their identities. Lupine was different from their original planet in so many ways, it was easy after a generation or two to forget what it had meant to walk on grass or swim in the sea. With their obscure rituals and strict laws, the elders made sure to preserve the collective memory of a bygone era. Valentine had never been a religious person and suspected most of tonight’s ceremony was made up by the elders and didn’t resemble its Earth equivalent at all. Perfumed, anointed with the holy oil, dressed up, freshly shaved, and coiffured, Valentine was ready to do his part as the only remaining descendant of the House of Lobo. He wished he could still shift like his ancestors had done, so he could avoid the spectacle awaiting him. Valentine nodded and followed the trio outside.